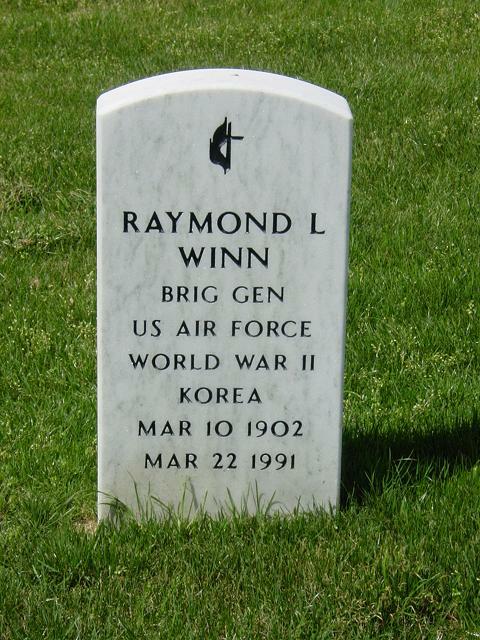 Raymond Lloyd Winn was born in Kanorodo, Kansas, in 1902. He graduated from high school at Greenley, Colorado, and attended Colorado Agricultural College for three years. Appointed a flying cadet in February 1928, General Winn graduated from primary and advanced flying schools on Feb. 28, 1929, and was commissioned a second lieutenant in the Air Reserve. He received his regular commission as a second lieutenant of Air Corps on May 2, 1929 and was assigned to the Eighth Attack Squadron at Fort Crockett, Texas. In September 1930 he became a flying instructor at the primary flying school, Brooks Field, Texas and in October 1931 transferred to Randolph Field, Texas in that capacity. Three years later he joined the 26th Attack Squadron at Schofield Barracks in Hawaii. First Air Force there. In April 1942 he was assigned to the Army Air Force Southwest Training Center at Maxwell Field as assistant for operations and the following January assumed command of Gunter Field, Alabama, a part of the Army Air Force Eastern Flying Training Command. Moving to Pyote, Texas in August 1945, General Winn became commander of the 301st Bomb Group. He was a patient at the Army Air Force Hospital in San Antonio, Texas from October to November 1945 and then went to Fort Worth, Texas pending assignment. Ordered to Germany in April 1946, General Winn was named deputy commander of the Wiesbaden Air Force Station, becoming commander that August. The general was appointed deputy chief of staff in December 1946; acting chief of staff from October 1947 to June 1948; and then resumed his former duties as deputy chief of staff. Returning to the United States in April 1949, General Winn assumed command of the Ninth Strategic Reconnaissance Wing at Fairfield-Suisun Air Force Base, California. Named chief of staff of the 311th Air Division at Forbes Air Force Base, Kansas, that June, four months later he became chief of staff of the Second Air Force at Barksdale Air Force Base, Louisiana. In March 1952 the general was given temporary duty as commander of the 307th Bomb Wing in January and that November assumed command of the 806th Air Division at Lake Charles Air Force Base, Louisiana. Joining the Air Materiel Command on Aug. 25, 1954, General Winn was named chief of the Transportation and Packaging Division at Wright-Patterson Air Force Base, Ohio and the following Feb. 9 was redesignated director of transportation and services there. Reassigned to Air Force Headquarters on June 1, 1956, the general assumed duties as director of transportation in the Office of the Deputy Chief of Staff for Materiel. His decorations include the Legion of Merit, Distinguished Flying Cross, Air Medal and the French Legion of Honour. He is rated a command pilot, combat aircraft and technical observer. (permanent) May 2, 1946; to colonel (permanent) April 2, 1948; to brigadier general (temporary) Sept. 5, 1952. General Winn was buried with full military honors in Section 34 of Arlington National Cemetery.